I am not a southern grandma. I don’t have a biscuit recipe that was handed down from cook to cook as one generation hung onto the apron strings of the last. My family embraced technology and welcomed the dough boy and bisquick into the home as soon as they hit the market. Some people buy the latest car and use the latest phone, my grandmas embraced the bleeding edge of technology as it made their lives easier and changed the family cuisine for most of the 20th century. For some odd reason, I decided that I needed to learn how to make biscuits. I have experimented with some different techniques and would like to share my findings. I didn’t take too many photos of the hops along the way, so you’ll have to take my word for it when I say that something leads to lackluster biscuits. The internet is a scary place when it comes to the hunt for the biscuit recipe. Every variation that can be made is made, and steps that are taken for granted by folks who grew up in a biscuit house are left out. I went through several iterations until I found a method and recipe that met with my philosophy. It has to be simple, only the star ingredients are allowed to be unitaskers, and it has to be tasty. So let’s get started by chewing the fat. 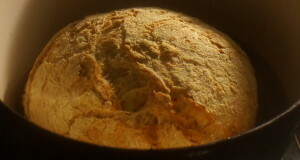 The fat is a major part of what differentiates a biscuit from a soda bread. If you combine flour, salt, baking soda/powder, and buttermilk, you end up with a soda bread dough. 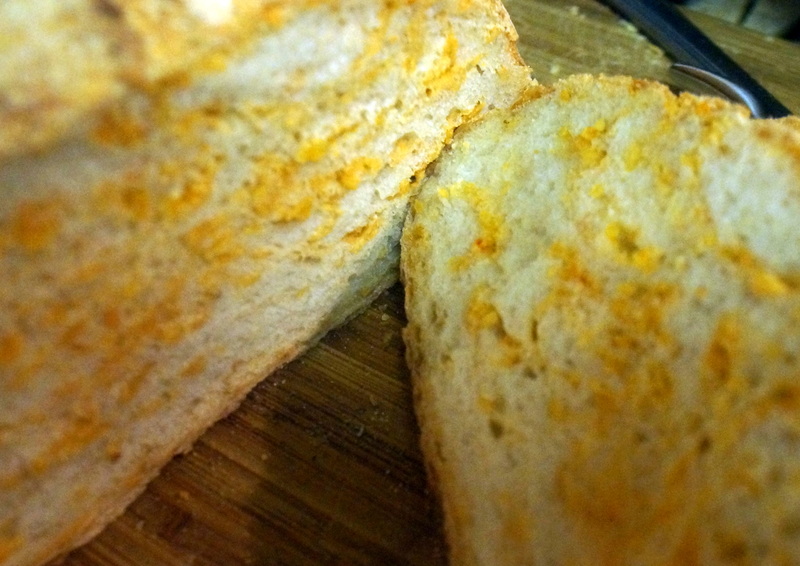 Cut in some fat, adjust the ratio, and cut into rounds or squares, and they become biscuits. When adding the fat, the internet says it should be chilled, and it should be cut in with a food processor or with a fork so that pea sized balls of fat are visible. When it comes to selecting fat, the fat only has a minor impact on the finished product. It is noticeable, but picking butter or shortening or lard should be a matter of personal preference. Each has its positives and negatives. Butter is expensive and can melt in kitchen temperatures, keeping the dough cool enough is more of a concern, but it does add a nice buttery taste. Shortening makes for taller biscuits, costs less on average, but can leave a waxy feeling on the palette if the biscuits don’t reach an internal temperature of 195ºF. I prefer using butter flavored shortening, but basting the top of the biscuits with some melted butter after they come out of the oven also makes some pretty good biscuits. I am also a fan of lard since it makes some awesome biscuits but isn’t as easy to measure as sticks of butter or shortening. I have made biscuits with bacon grease, but it can be very challenging to keep from melting and can lead to grainy biscuits if given half a chance to melt. I started my biscuit quest by adding some bacon grease to the dry ingredients and ended up with a lumpy, grainy mess of a biscuit. I thought that because adding the melted fat to the mix ended up looking and feeling like bisquick, I would be fine, but I was so very wrong. My first biscuit revelation was that there was a difference between fat coated flour and flour coated fat. Biscuits need tiny, discrete blobs of fat and adding melted fat that coats the granules leads to grainy, flat biscuits. Over-incorporated fat is bad. I found one recipe that suggested using a cheese grater and while that did result in the desired texture, it also resulted in more fat sticking to the grater than ending up in the mix. I settled on cutting the fat into cubes or slices with a fork and then pulling them apart and crushing them with my fingers in the flour until they’re dime sized disks. I rely on the stirring and kneading to break them down to size but not over-incorporate. This allows for more bubbles to form where the fat melts away which can then harness the lift of your chemical leavening agents. I say chemical leavening agents because I did briefly flirt with getting some lift from yeast. While adding yeast did alter the flavor a little, proofing overnight lead to chewier biscuits that towered over every attempt before or since. In reality, they were dangerously close to being rolls and having to make ahead defeats the allure of an almost sporadic breakfast treat. 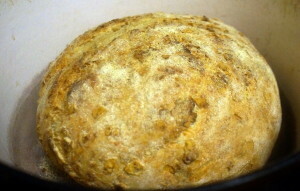 I remade the recipe without the yeast or the overnight proof and found that except for a less chewy texture and less bready taste, the results were largely equivalent. Some recipes for “Angel Biscuits” say yeast is where it’s at, but the conditions that encourage yeast growth also encourage gluten formation which gets you 90% of the way to a tasty biscuit. Remember the baking soda and vinegar volcanoes you played with as a kid? 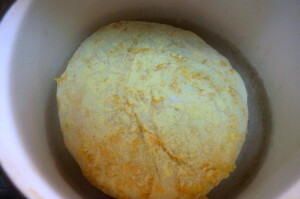 The same thing is happening inside the dough as it’s rising. 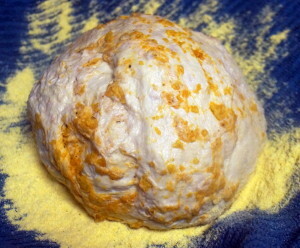 Baking powder is baking soda with the acidic cream of tartar added. Add water, and it begins to foam at a slower rate than the baking soda and vinegar volcanoes. Depending on the acidity of your dough (primarily from the buttermilk vs regular milk), you’ll want to add some baking soda for better lift in an acidic environment. As a final note, make sure that your baking powder is fresh since it does contain both an acid and a base and will slowly react over time due to the humidity and lose its potency. Some flours are self rising, but I don’t keep that many varieties of flour in my pantry, a bag of all purpose flour will sometimes be joined by some bread flour if I feel like cooking bread, but AP flour is good enough. If you want to save the effort of measuring out a few teaspoons of baking powder and salt into a few cups of flour, buy self rising flour. At this point though, we are dangerously close to bisquick. You can use what you want. I won’t judge. It’s your kitchen. The eternal debate over buttermilk vs milk is a fairly low key one. People associate buttermilk biscuits with premium and advertisers have seized on that to sell more biscuits. Buttermilk is sour and thicker than regular milk, and has some acidity that needs to be balanced with some baking soda. When cooking with buttermilk, it does add some flavor, but is hard to compare to regular milk as it doesn’t become a single ingredient substitution. By the time the recipe is rebalanced to account for the different flavor and change to the pH, direct comparison is unfair and any changes in height, texture, and composition can’t be entirely attributed to the buttermilk substitution. In the end, my audience could only point out that I did “something” different when I made with buttermilk, but wouldn’t be able to attribute the change to an ingredient swap. Biscuit recipes also call for salt and sugar. Add sugar to preference and don’t over salt. I wrote “Tbsp” where I should have written “tsp” once and had to throw out a batch. Again, in a traditional food stuff, there is disagreement about everything. How many times should you knead it? Should you knead it at all? Do you sift or stir your dry ingredients? Do you add all the liquid at once or do you add it a half cup at a time? Do you cut in the fat with a fork, your fingers, or a food processor? Do you cook in the 350º-400º range or do you set the oven to 500º or higher? Do you twist the cutter or not? 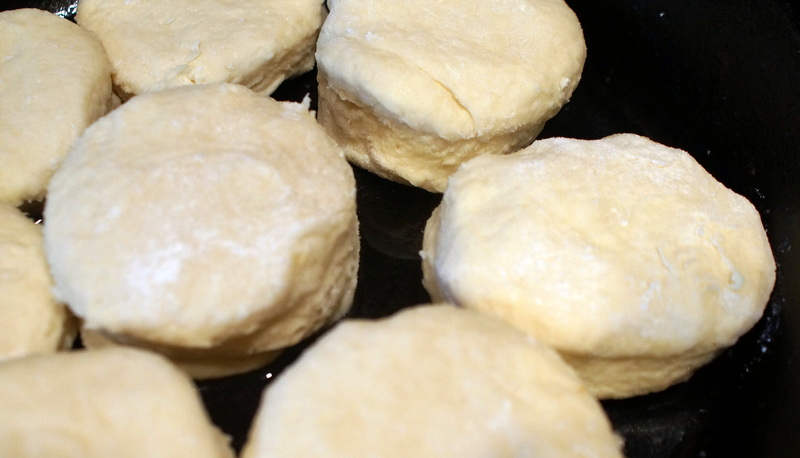 Do you make square biscuits or round ones? How far should you space them? Do you cook it on a cookie sheet, a cast iron baking pan, or a cast iron skillet? Do you want a drier dough or a wetter one? Do you bake or fry them? Some bits of biscuit dogma (dogma biscuits?) are old wives tales such as not letting your biscuits sit on the counter for any longer than it takes to cut and place them. The fact that so many variations exist should show just how resilient the biscuit recipe is. It is not a delicate souffle where ratios have to be perfect, it’s not a pasta sauce where the secret ingredient is really adding just the right amount of a few ingredients. It is a recipe that cooks have eyeballed for generations and pursuing perfection is missing the point. You can mess it up though. I have already talked about cutting in the fat, but when it comes to combining the dry ingredients, mix together flour, sugar, salt, and baking powder first with a spoon. Some people sift but that’s just a little bit of added complexity that isn’t entirely necessary. 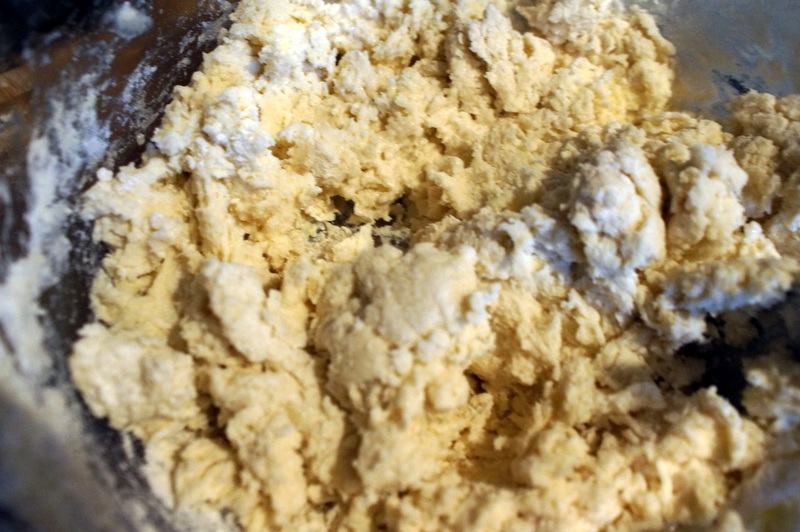 After briefly stirring the dry ingredients together, cut in the fat leaving discrete flour coated chunks of fat. Add in 1/4c of cold water and stir, then I add 1/2c of milk, stir a little bit more, and stir in the final 1/2c of milk before turning the bowl out. 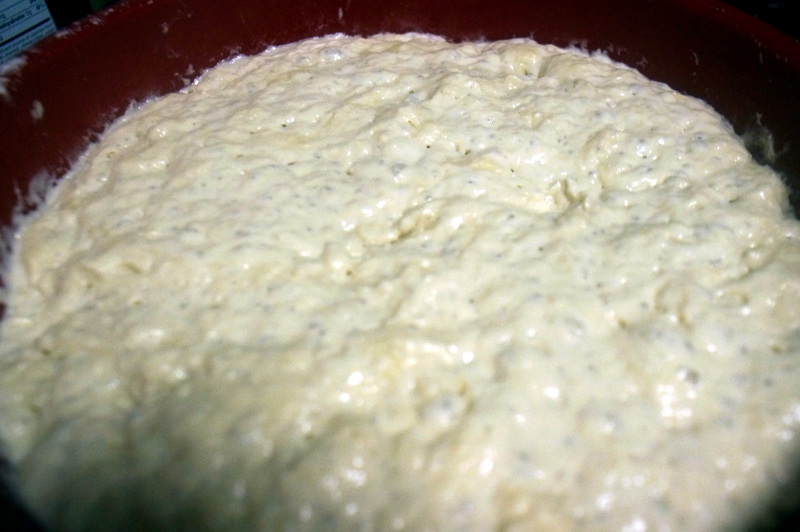 I find that is a good balance to prevent overworking of the dough while preventing clumps of the dry mixture. 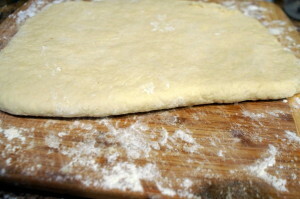 When it comes to kneading biscuits, I keep a bag of flour handy for the work surface and the dough itself. My recipe tends towards a wetter dough that will stick to the work surface if you don’t dust and flip each time. You don’t knead biscuits like you knead bread, the goal is to fold over layers, press down, and fold again. This distributes the fat evenly, builds just enough gluten that the biscuits do the lifty thing, and builds a layered biscuit that is easy to pull apart and spread with butter or jam. I fold it in half 10 times, dusting with a little bit of flour, flipping the dough, and turning it 90 degrees each time. The more you knead it, the chewier the biscuit will get, the less you knead it, the less cohesive but more tender the biscuit. After folding, dusting, compressing, and turning the dough 10 times, I break out my rolling pin and roll my dough out to a height between 3/4” and 1”. This height yields 8 biscuits that fit in my 10” cast iron skillet. When it comes to pressing the cutter straight down or cutting and turning, that is a texture thing that only impacts the outer edge of the biscuit. Some people put dimples in the top of their biscuits to allow for an even rise but I do it because it catches the melted butter I pour over the dough. It has very little impact on the final product. Same with square vs round biscuits. I have made a few batches of very good square biscuits and would have to say that only cutting once and not having to re-roll to cut some more is a definite benefit. However it is hard to get even biscuits and the cutter leads the way in consistency. Something that I learned from the angel biscuit experiment is that biscuits dough doesn’t turn to paste if you let it sit somewhere and even benefits from being given a chance to relax and rise. Some people want all the rising to happen in the oven but I like my biscuits tall and say that any rise is good rise. I personally don’t start preheating the oven until the biscuits are in the pan. I also preheat my oven to 400º as the proponents of the higher temperature say that the increased heat leads to increased steam and increased bubbles. I get enough height from my recipe that running the risk of burning the bottoms while leaving the insides raw is not a problem. If you like crispier biscuits, by all means, try a higher temperature, biscuits are forgiving. When it comes to the cooking vessel, some people like a flat sheet but I like the cast iron skillet. My recipe perfectly fills a 10” cast iron skillet, giving just enough room for them to expand and cook evenly, but not so much room that they rise out instead of up. People say space your biscuits 1/8” apart so they rise up and not out and I had one batch of biscuits made in the center of a cookie sheet that definitely cooked out. It reminded me of a giant chocolate chip cookie. Finally, I cook my biscuits for 18 minutes, turning halfway through in the middle of the oven, but that is because my family prefers paler biscuits. If you want more browning, cook for longer. No matter how long you cook it, make sure the internal temperature reaches 185ºF, and I prefer mine to hit 195ºF. I have had to learn how to make biscuits from scratch, from scratch. 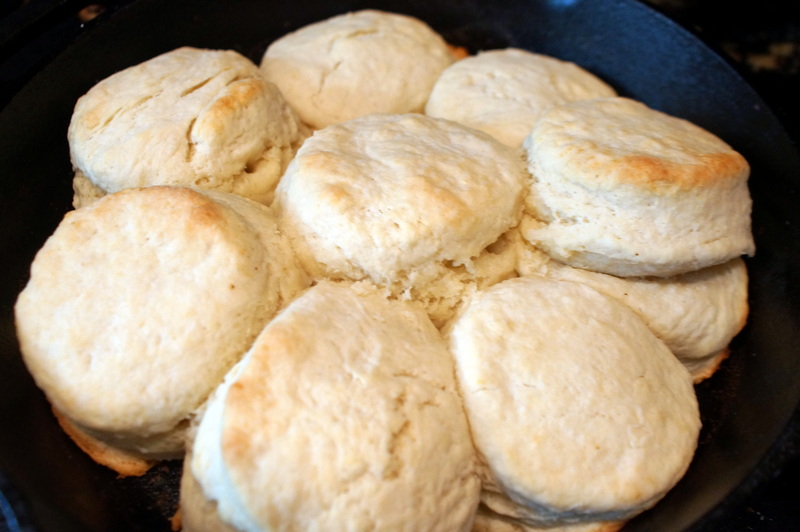 Hopefully this will help take some of the mystery out of cooking biscuits for you and save you some time on your quest for the perfect imperfect biscuit. All things considered, this entry is entirely too long. Prep time: 15 minutes, cook time, 18-22 minutes. Total time, 1 hour. Stir together flour, sugar, salt, and baking powder. 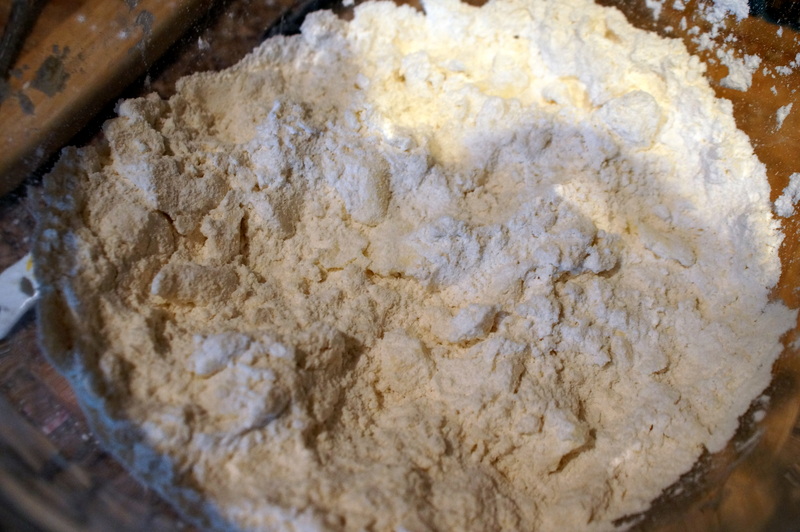 Cut the fat into cubes and then cut it into the dry mixture, leaving bits of fat roughly the size of a pea in the flour. Stir in the water, then 1/2c of milk, then the final 1/2c of milk being careful to not over work the dough while incorporating all of the dry ingredients. Turn dough out onto a dusted work surface and knead 10 times, folding the dough over onto itself before dusting with a pinch more flour. Cut the dough into biscuits and grease the bottom of the pan with 1 tbsp of melted butter. Place the biscuits into the pan 1/8” apart so they grow up and not out. 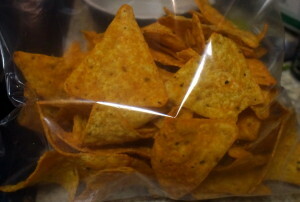 Preheat oven to 400º and bake for 18-22 minutes, turning the pan halfway. Drizzle the top of the biscuits with the remaining 2tbsp of melted butter. 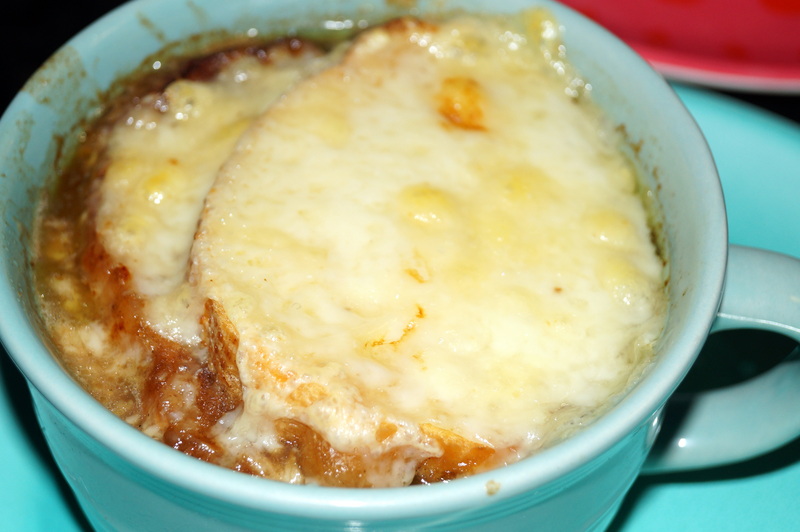 Did you ever have a recipe that you make just for the leftovers? I have one such recipe where the main dish comes out pretty good, but when the ingredients are re-purposed, magic happens. Want to jump to the recipe? Click here. I love cooking bone-in chicken. There’s something sterile and lost about cooking boneless skinless chicken breasts. They’re pure protein with little flavor, they dry out, and leak the white stuff if you turn away while you’re sauteing them. I do have a few recipes that do call for BSCBs, but there’s something majestic about bringing a chicken into your chicken. I love single pan recipes since they save on cleanup, and my new favorite single pan is a La Creuset that my parents got me for my birthday. I’ve wanted one for a decade now and it was worth the wait. Preheat the oven to 350ºF. In the roasting pan, melt 2 tbsp butter into 2 tbsp of olive oil. Mixing fats raises the smoke point of the butter but retains butter’s browning power. Salt and pepper four chicken thighs and brown in the pan. Make sure that you move the chicken constantly to prevent bonds from forming between the chicken’s proteins and the surface of the pan. When the chicken is browned on both sides, move them off to the side of the pan and toss in a leek that has been trimmed, halved, and cut into strips. 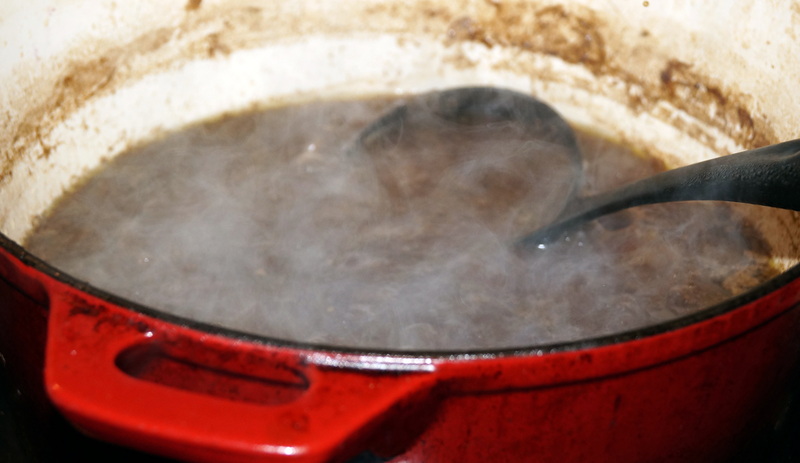 When the leek is clear, shuffle out of the way and toss in some mushrooms to brown in the fat, when the mushrooms are done, splash with 1/2 cup white wine and deglaze the bottom of the pan. Chop up four new potatoes into chunks and toss into the pan. Season with 10 sprigs of fresh thyme, 10 peeled garlic cloves (left whole), 1 tbsp rosemary, 1 tsp pepper, 1 tsp paprika, and 1-3 tbsp salt (depending). 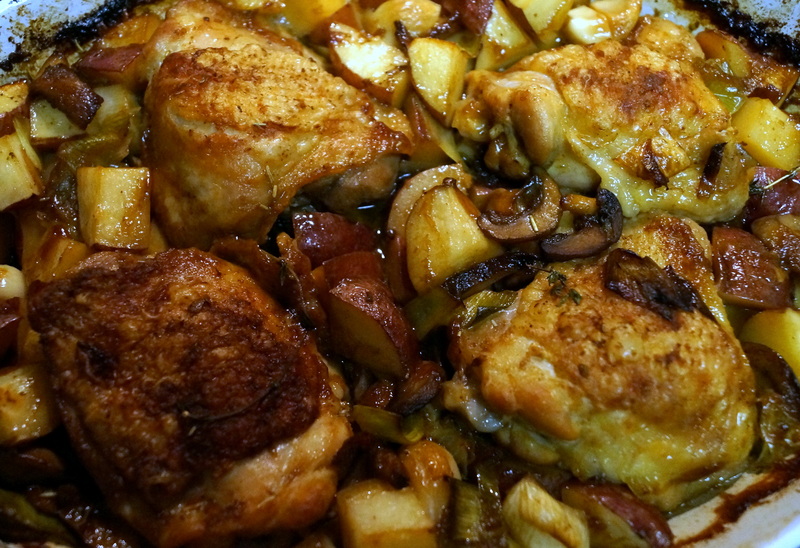 Move the chicken thighs back into the middle of the pot and make sure that all the chunkies are evenly mixed and distributed around. Pour 1/4 cup olive oil over everything and then cover with aluminum foil. Roast in the oven for 35-45 minutes, covered for the first 25-35 minutes and uncovered for the last 10. Let rest before serving. Now I alluded to the leftovers. There is magic in these thighs. Make sure you save the chunkies and the thigh meat. 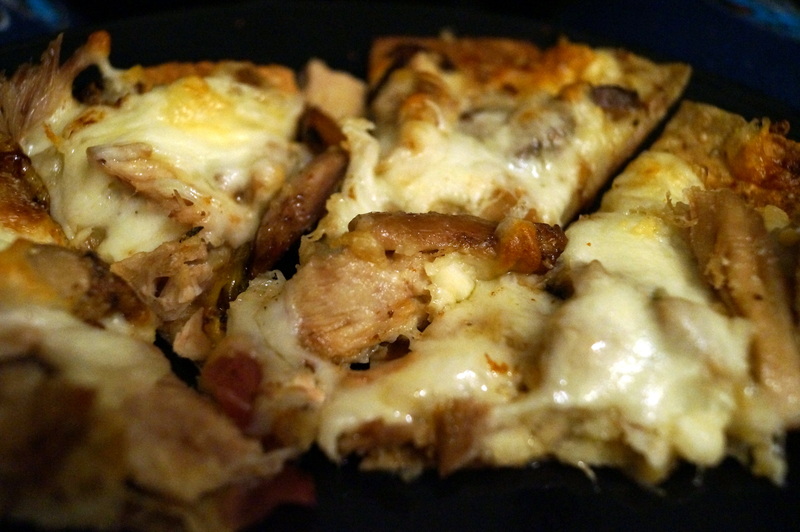 This was a dash of inspiration that was somewhat stolen from the Irish Pizza served by a pub in Harper’s Ferry. This is a dish that goes well with Guinness. Preheat the oven to 425ºF. Get out some soft tortilla shells. Spread the chunkies out on the tortillas, mashing the potatoes and spreading the garlic. Pull the meat off of the thigh bones and shred. Sprinkle the meat over the mashed chunkies and then sprinkle a handful of mozzarella cheese over the whole deal. Place on a parchment lined cookie sheet and bake for 10-15 minutes, until the shell is crispyish and the cheese is melted and bubbly. Slice with a pizza cutter. Preheat oven to 350ºF. 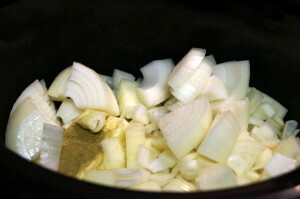 Add butter and 2 tbsp olive oil to an oven safe pan, melt on the cook top over medium heat. Salt and Pepper the chicken thighs and brown in the pan. Move chicken to the side and cook the leeks until clear. Move the leeks aside and brown the mushrooms. Add the white wine and bring to a boil. Add the garlic cloves, thyme, potatoes, rosemary, ground black pepper, paprika, and salt and toss to combine. Redistribute everything so the chicken lies flat. Cover and cook for 30 minutes, remove cover and cook for 10. Cook for 10-15 minutes until tortilla is crispy and cheese is bubbly.